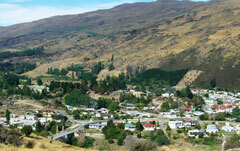 Gold was discovered in the Teviot River in 1862 and present day Roxburgh grew from there. It has seen boom and bust years and is now settled into the Teviot Valley as a prosperous fruit growing area and visitor destination. It has its own dry, healthy microclimate of warm summers and cool winters; so healthy that there has been a children’s health camp here for many years.